When Bernie Schwartz and his best friend, Maddie, walk through Akron Children’s Hospital, it’s hard for them to get far without being stopped. “Awww, can I pet her?” visitors say right before they’re greeted with a wagging tale and sloppy kisses. 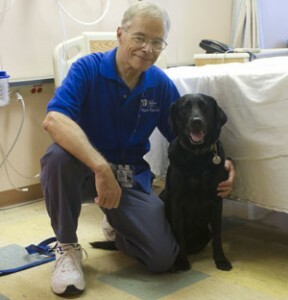 As the longest serving handler and an original member of Akron Children’s Doggie Brigade, Bernie has been bringing joy and comfort to sick kids for 20 years.